The Testo 510 replaces a tool box of low pressure measurement tools. With optional accessories, the 510 can be used for measuring manifold pressure, total external static pressure, pressure drops across coils and filters, air velocities (>800 FPM) with a Pitot tube. This differential pressure meter is ideally suitable for pressure measurements in the range 0 to 40"wc (or 9999 Pa). Testo 510's differential pressure measurement is temperature-compensated for accurate readings. Readings can be displayed in Pascal over the whole measurement range. Magnets at the back of the instrument enable hands-free operation, for instance, while adjusting gas regulators. When you connect the (-) port to a NEGATIVE pressure input you get the full 40 IWC range on NEGATIVE. When you connect the (+) port to a POSITIVE pressure input you get the full 40 IWC range on POSITIVE. 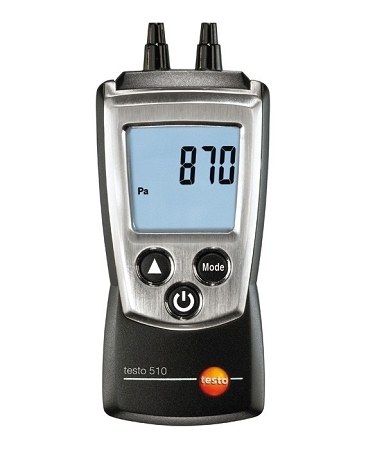 Q: I bought this testo 510 last year and it is not accurate. Is there a way I can recalibrate? Example at 50 pa pressure I measure from + side and it shows 43 pa and from - side shows -59 pa. So it is definitely off a bit. Sorry, there is no way to calibrate the device in the field. Please contact Testo at 1-800-227-0729 for assistance. Remember, when going over 10 Pa or below 0 Pa, your reading needs to be corrected by 1.5% of reading. If readings go farther out of range than this, Testo does have a two-year warranty. Testo Customer Service link below to help with warranty claims. 144 TruReward$ points will be placed in your account when you buy this item.